Props are great to liven up a presentation and make things more tangible for your audience; even if they can't actually touch the props you bring. If you are doing a product introduction or demo of sorts, I strongly recommend to bring your product with you, if it fits on the stage somehow. Seeing a real person interacting with it, holding it, or simply standing next to it (if it's really big) will give your audience a much better idea of the size and use than any product photo on a slide could do. So if the goal of your presentation is to introduce and eventually sell a product, this should be a no-brainer. If you still need convincing, watch Steve Jobs introduce the MacBook Air (remember the manila envelope?) or, a personal favourite of mine, the iPod nano: Ever wondered what this pocket is for? What about other props? As a - rather obvious - rule of thumb, everything you bring on stage should have a purpose. Don't bring things for decoration (leave that to the stage designers) or just to make your company or product name more prominent (such as banners). Those would only distract from your actual presentation - or simply be ignored, in which case it was a waste of time and effort to bring them. The word props is usually associated with things that you use in your presentation, and usually something other than your product. You would bring a prop to visualise an abstract concept or idea, for example. You show something with a prop and then make a connection to the topic of your presentation. A prop should therefore be relevant, both to your topic and for the progress and understanding of your presentation. A prop could be an everyday item that you use to explain a more abstract idea. Or it could be an unusual item, something that makes your audience wonder what it is, until you explain its relevance (which better be very obvious, once explained). Or it could be something you don't usually see, yet is common or important. Jill Bolte Taylor created one of the first "TED moments" when she brought a real human brain to the stage. And it was not for show - it was central to the topic of her talk after all. The effect (listen to the audience reactions in the video!) was much bigger and - in a way - more real and tangible than if she had just shown a photo and the usual diagrams on a slide. Amanda Palmer brought a crate and a hat to the stage to show how it looked like when she was standing on such a crate as a street performer. She could just as well have shown some photos (which she did, too, but later) but these props made it more tangible and gave her a chance to refer to them, both physically (by pointing) and metaphorically ("stepping down from my box"), throughout the talk. The entire topic of the talk came from the idea and concept that she thought of while standing on such a crate for hours. You don't have to go with something out of the ordinary; it can be something very simple, as long as it is relevant to your point. 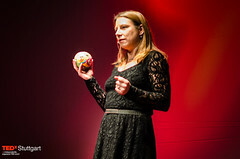 Heike Schettler, in her 2014 talk at TEDxStuttgart, mentioned that children learn by dropping things, first accidentally, then on purpose, to re-test the hypothesis that they formed from the accident. Every parent has experienced this: Their toddler drops a toy, the parent picks it up and hands it back - only to have the toddler drop it again. And again. And again. So I suggested that at that point in her talk, she'd demonstrate it by actually dropping and picking up a toy. As you can see in the video, she expanded on that idea by throwing the ball a bit further away and picking it up again later in her talk, when she came back to this very point. It's such a simple thing, yet makes the connection between the real life experience and her - inevitably more abstract - explanations much stronger and more apparent. Unless we're talking about a product, the purpose of a prop is to make something abstract visual and easier to understand. To make this work, the prop should be something the audience can relate to, e.g. an everyday object. And of course you should only bring props if they are relevant to your talk and topic, i.e. don't use them just for show. That latter point is something I've seen presenters forget. For example, I know a presenter who likes to show magic tricks during his presentations. There's nothing wrong with that; a nice and relevant trick can be just the right thing to do to make your point. The person I'm thinking of, however, likes magic tricks so much that his presentations tend to turn into shows - the point of the presentation can easily get lost between all those tricks. This also answers the question: Can you overdo the use of props? Yes, you can. As with slides, and content in general, it's a good idea to take a step back and ask yourself the all-important question: So what? What's the point of using this prop? Does it help the audience "get" and remember your point better? Or are you bringing or showing this prop because it's "cool" or to stroke your ego? Don't forget that you should always start with the content of your presentation: What is the point you're trying to make? Is it relevant to your audience? Only then start thinking about how you want to make that point. You could tell a story, cite a study, design a helpful slide - or bring a prop. But it's just one of many options. "Using Props in Presentations - Can You Overdo It?" by Dirk Haun is licensed under a Creative Commons Attribution-ShareAlike 4.0 International Licence.